Two classic, red beauties come together for the holidays. A snowy road sets the scene for our truck-themed, melamine pot, which carries home our biggest and best solid red amaryllis. 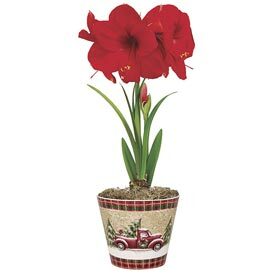 A must-have for collectors, Miracle delivers 1-2 sturdy stalks per bulb, each with up to five 8" flowers. Available as a one- or two-bulb planting. 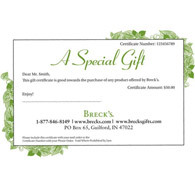 Take your pick, and we'll haul one right to your recipient's front door. EXCLUSIVE. 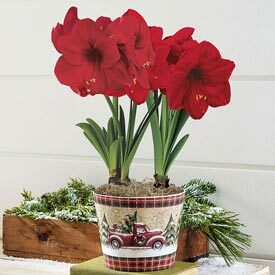 I gave this single-stem amaryllis to four friends and myself for Christmas. I've had many amaryllis over the years, but this one has been truly extraordinary. It began blooming before Christmas. The first stem produced four huge blooms, which lasted at least two weeks. The second stem produced five equally large blooms, which also lasted at least two weeks. And the third stem produced four blooms, which are only now (on February 12) beginning to fade. It has been an amazing display, and I plan to give this amaryllis to many more next Christmas. These are gorgeous. 2 blooms per bulb for 16 flowers. Deep red.